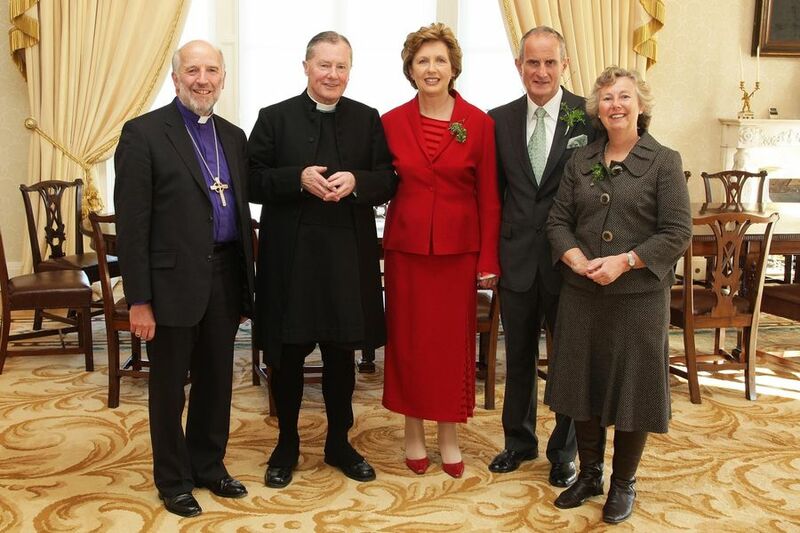 No I couldn’t resist putting this in – our visit to President Mary McAleese’s St Patrick’s Day Reception. This was the day she quoted Ulster poet, John Hewitt, ‘We build to fill the centuries’ arrears.’ On her left, her husband, Martin. The person on my left – whom my hero, violinist Nigel Kennedy, would probably call the ‘geezer in the gaiters’ – is Very Rev Robert McCarthy, Dean of St Patrick’s Cathedral in Dublin – successor to Dean Swift. Speaking of Nigel … I’m gradually realising that one of the games one plays on the side in this blogging business is that of attempting to get links back to one’s blog established in ever more exotic places. So I’m quite please to have my link on Nig’s [un] official Fan Club Website You’ll find it on the Links page as David from Perth – well – nearly there! Is there a gaiter tradition in Ireland? I remember being told that people in charge of cathedrals did not customarily wear them as they did not regularly take to horseback in their ministry. Is this misinformation? It is a little disappointing that you are not sporting purple ones. Sorry no gaiter tradition in Ireland. Tho’ it seems to me that there is utilitarian potential for those of us who are both cyclists and have varicourse veins. Too much information maybe? PS Is that Phoenix Park? Phoenix Park – yes the very identical one. The President lives in what was the Vice-Regal Lodge – summer residence of the Viceroy. And this is the Park where the Chief Secretary for Ireland was murdered by the Invincibles in 1881, I think it was. I remember it as if it was yesterday.